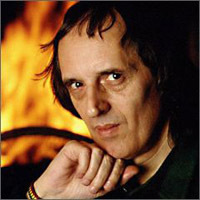 One of the most influential and popular Italian horror directors, Dario Argento was born in Rome on 7 September 1940. The son of Brazilian photographer Elda Luxardo and cinema producer Salvatore Argento, young Dario clearly had the world of film in focus from an early age. After finishing high school, Argento began his career as a film critic writing for the Roman newspaper Paese Sera. Before long, Argento set his sights on penning (among others) such late '60s westerns as Cemetery without Crosses (1969) and Sergio Leone's epic masterpiece Once Upon a Time in the West (also '69). His superior 1970 directorial debut The Bird with the Crystal Plumage not only initiated his 'animal trilogy' but more importantly, established him worldwide as a stylistic force in horror films. On par with the best of fellow contemporaries Sergio Martino and Umberto Lenzi, Argento churned out two solid giallos in 1971: the rather underrated The Cat O'Nine Tails and the effective Four Flies on Grey Velvet. But it wasn't until 1975 with Profondo Rosso that Argento's work began to achieve a form all his own. His best giallo, Profondo follows a generally typical Italian thriller plot arc but is graced throughout with interesting photography, excellent death sequences and a pounding score by the group Goblin. 1977 saw Argento add (arguably) the most well regarded entry to his filmography with the gory opera Suspiria. The first entry in his Three Mothers occult trilogy, Suspiria is trademark Argento. The story of a young American ballet dancer who attends a German dance academy and discovers a deadly coven of witches, Suspiria is a whirling dervish terror classic of colored lights, sound, blood and mood. Inferno (1980) was the second entry in Argento's Three Mothers triumvirate. A perhaps mixed but not unrewarding bag, Inferno again sets its sights on a powerful witch house (this time in New York) and the gruesome fate that awaits those who venture too close to its secret. Argento revisited the traditional giallo format (indeed, aided in revitalizing it) with 1982's Tenebre AKA Unsane. A successful mix of electric murder scenes and memorable score, the sun drenched Tenebre is one of Argento's least cluttered and most enjoyable bloodbaths straight up. The remainder of the 1980s saw more mayhem from Argento with 1984's somewhat offkilter (but visually interesting) Phenomena, as well as 1987's expert slasher thriller Opera. The advent of the 1990s did little to sate the director's thirst for interestingly macabre work - but the results weren't always up to the high standards set by the best of his '70s and '80s creations. His 1990 collaboration with George Romero, Two Evil Eyes remains an uneven and occasionally lackluster piece. In 1993, Argento released the generally disappointing and inconsistent Trauma. The director's work in recent years remains a muddied cloud of subjectivity. Rarely do his offerings now achieve the powerful simplicity of his early career work; indeed his newer efforts can often seem plagued by a filter of only acceptable mediocrity, a la 1998's Phantom of the Opera and the third of the Three Mothers trilogy, The Mother of Tears (2007). Critics of the famed director often say that his films are exasperating examples of style over substance. And while one could most certainly wish Argento's scripts came more thoroughly cooked...nevertheless, his overwhelming bravura style combined with a knack for stimulating visual-audio imagery often compensate the viewer for his shortcomings in logic. Hallmarks of classic Argento? Inventive camerawork, alternately dreamlike and garish lighting, pulsating soundtracks by the rock group Goblin, convoluted plotwork...it's all unmistakably Argento's. Often quite gory, the best of the director's films are nightmarish odysseys, the murders sometimes so creatively done, they verge on blood art.